In this chapter, we continue our discussion of fuzzy criterion dynamic programming. We focus on its extension to the multidimensional case using, again as our vehicle, the open inventory network. 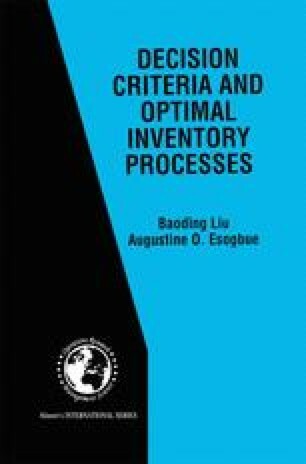 This is an instructive framework for treating problems typified by stochastic multi-location inventory systems as well as multi-reservoir operations. The objective of the model is to maximize the expected fuzzy criterion function of the product of fuzzy criterion sets. We shall provide proofs for the existence, uniqueness, and stability theorems of solutions associated with this model. We end this chapter by presenting a decomposition algorithm which we have developed for solving large scale problems associated with the model. We illustrate the application of the algorithm via an example involving a multi reservoir joint operations problem. These models and applications were first reported in Esogbue and Liu [?] and later in Esogbue and Liu [? ].